Point Pleasant senior Alec Smith tosses the ball to first base for a force out during the fourth inning of Monday night’s non-conference baseball contest against Buffalo in Point Pleasant, W.Va.
POINT PLEASANT, W.Va. — A no-no to add to the mo-mo. 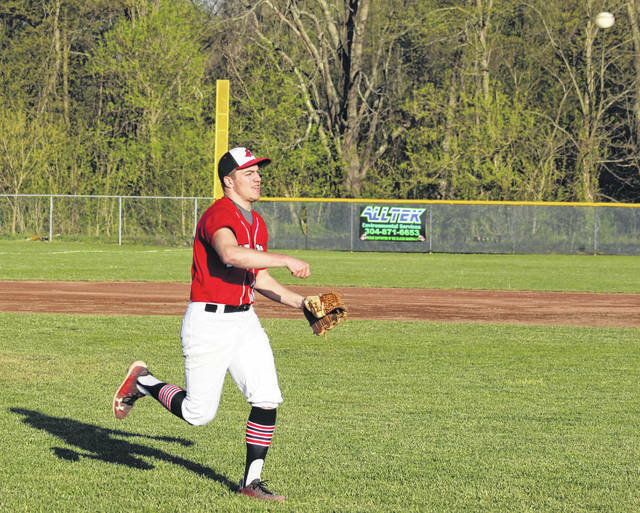 The Point Pleasant baseball team notched its third consecutive win and celebrated Senior Night in style Monday as senior Alec Smith tossed a no-hitter during a 10-0 mercy-rule victory over visiting Buffalo in a non-conference matchup in Mason County. The Big Blacks (11-9) honored three seniors — Smith, Ian Fielder and Tucker Mayes — before the game, then the hosts proceeded to waste no time in giving those upperclassmen a proper send-off. Smith handled the Bison on the mound, allowing only three walks over five innings without striking out a single batter. In fact, BHS sent the minimum dozen batters to the plate through four frames, which included a single baserunner in the second that was picked off by an inning-ending double play. The Blue and Gold also drew a leadoff walk in the fifth that eventually turned into a double play one batter later, then the final walk came just before Buffalo’s final out — a 4-3 ground out. In fact, 11 of the guests’ 15 outs were because of ground balls. The Red and Black, on the other hand, gradually kept building a lead for Smith to work with — starting with a two-out Austin Richardson homer to left-center in the bottom half of the first. That solo shot gave the hosts a permanent lead of 1-0. The Big Blacks doubled that edge in the second as a one-out wild pitch allowed Brody Jeffers to score from third for a 2-0 contest. 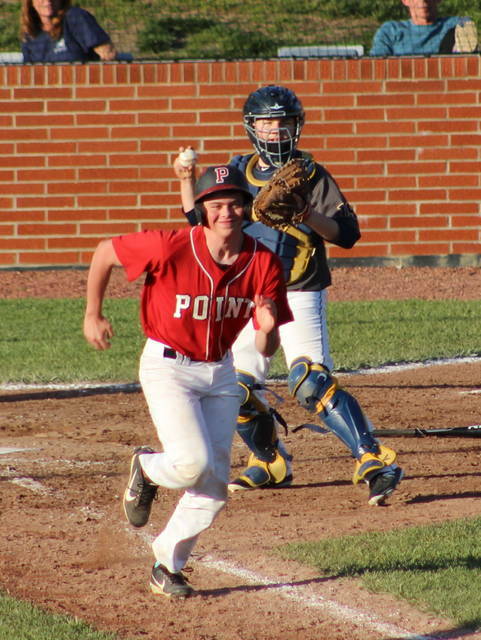 Point Pleasant again doubled its lead in the bottom of the third as Joel Beattie delivered a two-out single to right, allowing both Miles Williams and Richardson to come plateward for a 4-0 cushion. The hosts finished things off in the home half of the fifth after plating six runs on two hits, three hits batters, two errors and a walk. Richardson started the frame with a walk and advanced to second when Tucker Mayes was hit by a pitch. Jeffers then walked to load the bases and Richardson scored on a wild pitch for a five-run edge. Beattie followed by getting hit by a pitch to again load the bases, then Hunter Bush was plunked and Mayes came in with another run for a 6-0 advantage. Alec Smith lifted a fly ball to right that allowed Jeffers to score on a sacrifice, then Williams delivered a two-out single to right that plated Wyatt Wilson for an 8-0 lead. 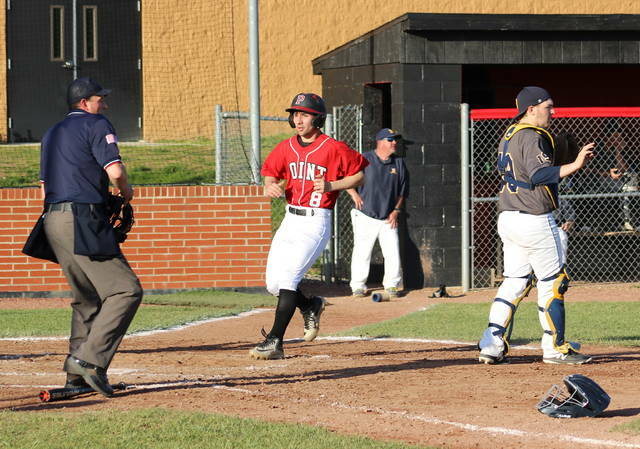 Carter Smith followed with a single to left, and an error on the play allowed both Bush and Williams to come home with the game-clinching runs. On a night in which everything clicked, PPHS coach Andrew Blain was pleased that his seniors were able to enjoy one final victory at home. More importantly, the fifth-year mentor was pleased to see even more signs that his troops are peaking at exactly the right time. “It’s not a big group of seniors, but for Alec to throw a no-hitter … it’s a memory that he and those upperclassmen will have for the rest of their lives,” Blain said. “Alec threw strikes and we made some good plays behind him defensively. Good things happen when you keep the ball around the strike zone. The Big Blacks produced seven hits and also played an error-free game, while the guests committed two miscues. The hosts stranded four on base, while the Bison left only one on the bags. Smith was the winning pitcher of record after tossing only 59 pitches over five innings. Dillman took the loss after surrendering nine runs (five earned), five hits and one walk over four-plus innings while fanning four. Williams and Richardson led the Big Blacks with two hits apiece, followed by Jeffers, Beattie and Carter Smith with a safety each. Beattie drove in a team-best two RBIs, while Richardson led the hosts with three runs scored. Point Pleasant returns to action Wednesday when it travels to Nitro for a 7 p.m. contest.